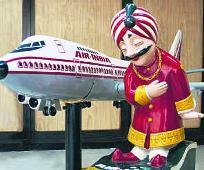 A group of ministers will consider Air India's demand for equity infusion of Rs 5,000 crore (Rs 50 billion) and its financial restructuring plan at a meeting in New Delhi on Wednesday as the airline has begun implementing a series of measures to reduce costs by Rs 3,000 crore (Rs 30 billion) annually. "The GoM on the civil aviation sector, headed by finance minister Pranab Mukherjee, is meeting in New Delhi on Wednesday as the government has broadly agreed to support Air India in its restructuring process," civil aviation minister Praful Patel said on Tuesday. The GoM would also look at a presentation of Air India on its restructuring plan and try to address the issues, keeping in mind the recommendations of the committee of secretaries, he said. Patel had said in Mumbai last week that the cash-strapped airline required around Rs 5,000 crore as additional equity infusion, a demand which was being considered by the government. He said the government and the airline will have to find ways together to find a solution to the current problem. Patel expressed confidence that the employees of the national carrier would contribute towards restructuring of the airline and work towards cost cutting and revenue enhancement. Air India is broadly looking at reducing costs by about Rs 3000 crore and enhancing revenues by Rs 2000 crore (Rs 20 billion) annually, which could lead it on a recovery path, Patel said.